Yes! 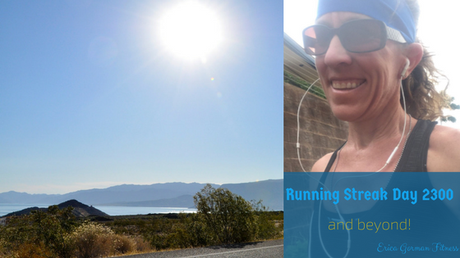 Yesterday was day 2300 of my running streak and a day worth blogging about. I shared a bit of my story on social media but kept it short and sweet. But honestly, there is so much more! 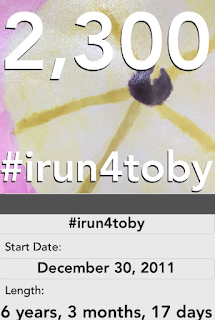 2300 days of running at least a mile a day. Running outside, running inside, running in sun, running in rain, running on streets, running on paths, running on the beach, running in airports, running in Texas, running in Illinois, running in Nebraska, running in California, running in Hawaii. I have also run in Spain but unfortunately, that was pre-streak days so does not count much today but that was a fun run. I kinda got lost. Kinda. I did not have to resort to my GPS map to guide me home but almost had to. But shhh....I don't think I told my mom I almost got lost in Spain. Those 2300 days also represent fast days, slow days, so-so days, painful days, running on pure joy days, and I don't wanna days. Yes, there have been I don't wanna days...more than I would like to admit but when it got down to it, when I looked at my reason for not running it did not seem to be the reason I would like to have to use every time I said I ran every day until x happened. That x needs to be a good reason. Not a lazy, pathetic reason. Not a weak mind reason. And I am thankful for this experience as it set me up to be a better support for my daughter when she recently struggled with a similar feeling as it relates to horseback riding. Y'all, whatever sport you choose, there are going to be bad days. Hey, there are bad days in life! We just need to learn to roll....or run....or ride....or JUMP with them! And don't forget to reward yourself for your achievements and you know what, I need to set up a reward system for darling! Her sport is hard! I just need to put one foot in front of the other. She is a heels down, toes up, leg on, close the hip angle, stay focused, type of sport. PHEW! I wonder if she knows how proud I am of her? I will need to tell her....again...and again, and again, and again. I set up just a thing for myself about 100 days ago. For every 100 day increment in my streak, I get to treat myself to something! My idea was a new running outfit. Bondi Band has a new Bondi Wear line with awesome stuff and hey, I do like to match and maybe look a bit stylish when I workout. I am in my workout gear a good chunk of each day so it matters. By the way, you can get 10% off when you shop at Bondi Band with my friends and family coupon code EGFITNESS. You can also get a 20% discount at SOS Rehydrate for an amazing electrolyte drink with the some code - EGFITNESS. But I am getting distracted in telling my story. Hey! I love sharing deals and products I love! If you have any affiliate links that don't compete with mine (sorry, no competition zone) enter them in the comments below, okay? I would love to support you if it is something I could use! And if I can't, maybe one of my readers can! Yes! A hula hoop! It is a weighted hula hoop and the segments can be moved around to make it easy, medium, or hard in effort levels. And y'all, I tried a couple workouts yesterday and it made me sweat! 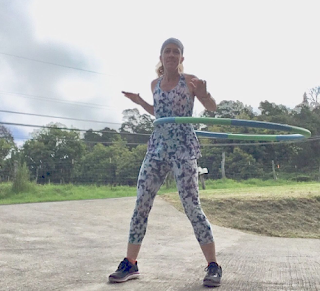 Who knew hula hooping workouts could be hard! And who knew it would work your arms and shoulders! I have really tight stressed out shoulders so some of the moves really worked, and stretched, those areas and this is a good thing to return to time after time. Did anyone else sing time after time? 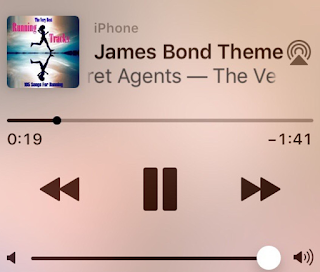 If you did you may also like this song that popped up when I was running today. I really do need to "run" now and get to work but I have one final thing I want to share. When I run before work near the office I don't get to shower. There is no hot water. That is a story for another day but I am not a cold shower type of gal. 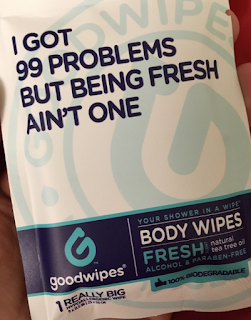 I have used athletic wipes more than once in the past but found these that are biodegradable (win!) and have peppermint and tea tree oil in them (another win!). There is also one with lavender oil! No affiliate link for these but I found them on Amazon and just wanted to share. Daily Gratitude: I am thankful for an amazing 4.2 mile run today --- outside in the wind!